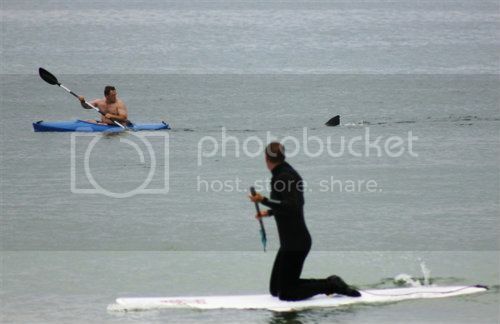 Great Whites, Kayakers, and Paddleboarders...Oh My! Behold! The Great White Shark Tribe has once again descended upon Cape Cod (it appears we are a gourmet destination for the big buggers thanks to our over-abundance of seals). The weekend yielded what is, in my opinion, the most awesome picture of the Great White Shark Tribe summering down on the Cape. Just for the record, this was taking place 150 feet off-shore in 8 feet of water. So we're talking really, really shallow water that's really, really close to shore. In any case, the Cape Cod Times has the obligatory "And then I wet my pants..." interview. For more of a nation-wide overview of the Great White Sharks' rekindled love of all things Cape Cod, MSNBC has more here. In any case, it appears the Great White Shark Tribe are here to stay as permanent summer tourists, much to the delight of the locals who are sucking up the yummy money from human shark-spotters. Although it appears that kayakers and paddleboarders may want to pay attention to the local Shark Spotters before taking to the seas. This entry was originally posted at http://liz-marcs.dreamwidth.org/429872.html and has comments. Please comment there using OpenID.